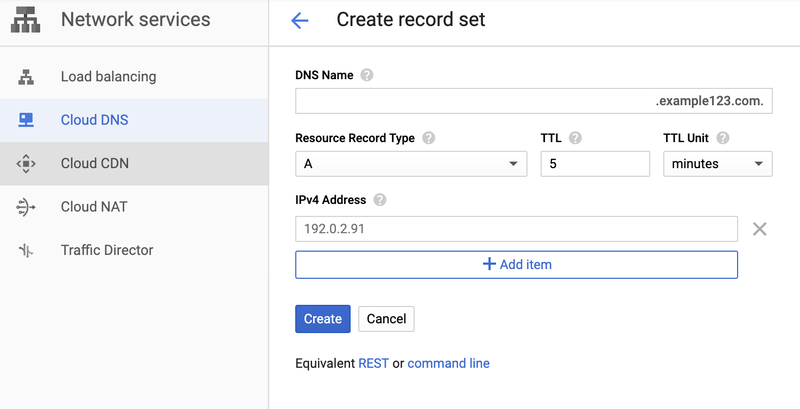 This page explains how to set up a Cloud DNS managed zone and a resource record for your domain name. It walks through a simple example of creating a managed zone, and then setting up Address (A) and Canonical Name (CNAME) records for the domain. For Cloud DNS concepts, see the Cloud DNS Overview. For Virtual Private Cloud network configuration information, see the VPC Overview. For configuration how-tos and API information, see What's next. A domain name through a domain name registrar. You can register a domain name through Google Domains or another domain registrar of your choice. An IP address to point the A record of your zone. A valid IP address can be a server you already have running with an IP address you can point to. For example, you can go through this tutorial to begin start up a web server on a Compute Engine VM. 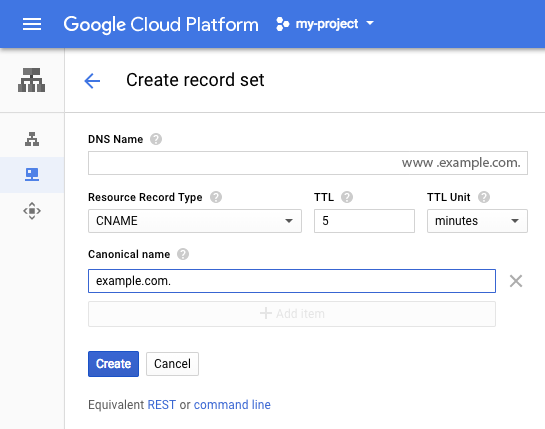 Go to the Create a DNS zone page in the GCP Console. Choose Public for the Zone type. Enter my-new-zone for the Zone name. Enter a DNS name prefix for the zone using a domain name that you own. For example, example.com. Under DNSSEC, keep the Off setting selected. The Zone details page is displayed. Note that default NS and SOA records have been created for you. A managed zone is a container for DNS records of the same DNS name suffix. A private managed zone is a container of DNS records that is only visible from one or more VPC networks that you specify. Choose Private for the Zone type. Select the networks to which the private zone will be visible. On the zone listing page, click the zone name to get to the records page. Create a new record to point the domain to an external IP address. If your IP address is in the form #.#.#.#, you have an IPv4 address and need to create an A record. If your IP address is in the format #:#:#:#:#:#:#:#, you have an IPv6 address and need to create an AAAA record. Click the zone where you want to add a record set. To create an A record, select A from the Resource Record Type menu. To create an AAAA record, select AAAA. Under IPv4 Address or IPv6 Address section, enter the IP address you want to use with this domain. Under DNS Name, enter www. Under Resource Record Type, choose CNAME. Under Canonical name, enter the domain name, followed by a period. For example, example.com.. The record update will take some time to propagate depending on the time-to-live (TTL) values in your zone. You can verify that the DNS records are working by visiting the domain name and confirming that the domain resolves to your IP address. Finally, you must update your domain's name servers to use Cloud DNS to publish your newly-created records to the Internet. Even if your domain name is registered with Google Domains, you still need to update the name servers — although they look very similar, the name servers used by Google Domains are not the same as those used by Cloud DNS for your managed zone. That's it, you successfully set up your DNS records using Cloud DNS. 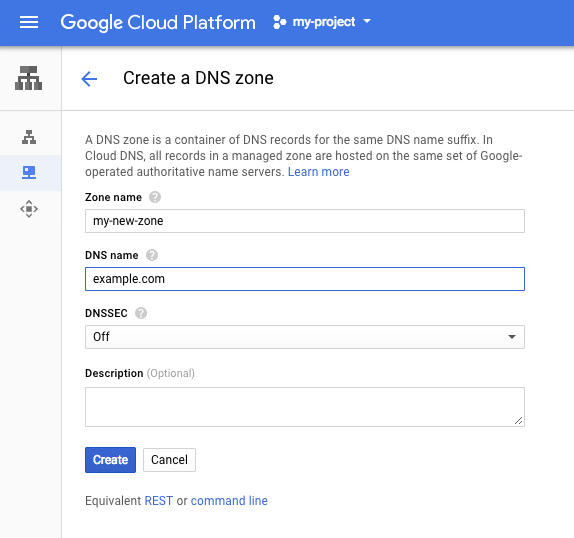 Go to the Cloud DNS Zones page in GCP Console. On the Cloud DNS Zones page, click the zone name (my-new-zone) to get to the Zone details page. Select the A and CNAME records that you created. Click the trash can icon next to the zone name (my-new-zone) to delete the zone. Manage records for Cloud DNS. Manage zones for Cloud DNS. Use the Cloud DNS REST API. Last updated March 26, 2019.